How does the MinexBank work? The interface of MinexBank is simple and user-friendly. However here is a little introduction on how it looks. At the top line of the Dashboard you can see the number of available for parking coins you have, i.e. how many coins you have at the address which is linked to the bank (1). Then there is the number of already parked coins (2). The last number shows your general balance, i.e. both parked and available for parking coins (3). To refresh your balance you should do some action, for example, click another tab of the MinexBank account (Payouts or Notifications). On the right of the numbers there is a Log Out button. Due to security reasons we recommend you not to save the password in your browser. MinexBank now automatically logs out after being inactive for 15 minutes. Below at the page you can see current interest rate of the bank for daily, weekly, monthly and yearly periods for parking (4). We do recommend you to check this block from time to time because interest rate may change quite often and you might find it more profitable to cancel your existing parking to re-park it again at the new interest rate. Then there is a parking block (5). You can see the interest you will gain if you park some amount of coins (or all of them) for any of the available parking periods. 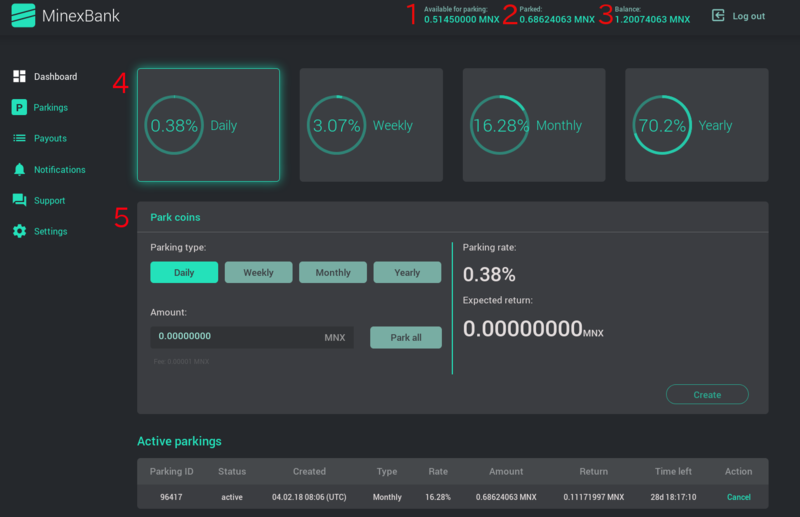 Further blocks show (6) Active Parkings (shows parked amount of coins, expected interest, parking period, date of parking, and the countdown) and (7) list of Payouts (i.e. how much interest have you received and the transactions’ hash addresses which you can check at http://minexexplorer.com at any time). NOTE: You DO NOT SEND any coins to MinexBank and you DO NOT HAVE the coins in the bank. All coins are ALWAYS in your wallet even when you park them. You receive a reward, i.e. interest, for keeping the coins in your wallet rather than sending them elsewhere to exchanges, i.e. selling them. Please feel free to contact us at any time if you have any further questions.